It was the 4th of July holiday weekend, and the Jemez area was packed! Every scenic stop was crawling with people, and every trailhead had a half mile of overflow parking along the road. Valles Caldera was impossible! Aside from a teeny little loop hike, the rest of that park was off-limits without a permit, and of course permits were long gone. Do you ever get that feeling “Get me out of here!” The crowds of holiday campers were making me wish I was somewhere else — some place peaceful, quiet, and uncrowded. So I abandoned the Jemez, blew by Valles Caldera, and headed towards Los Alamos. My destination was a boondocking spot in the Santa Fe National Forest. As you travel east from Valles Caldera, you go down a long, long hill that takes you through part of Bandelier National Monument. 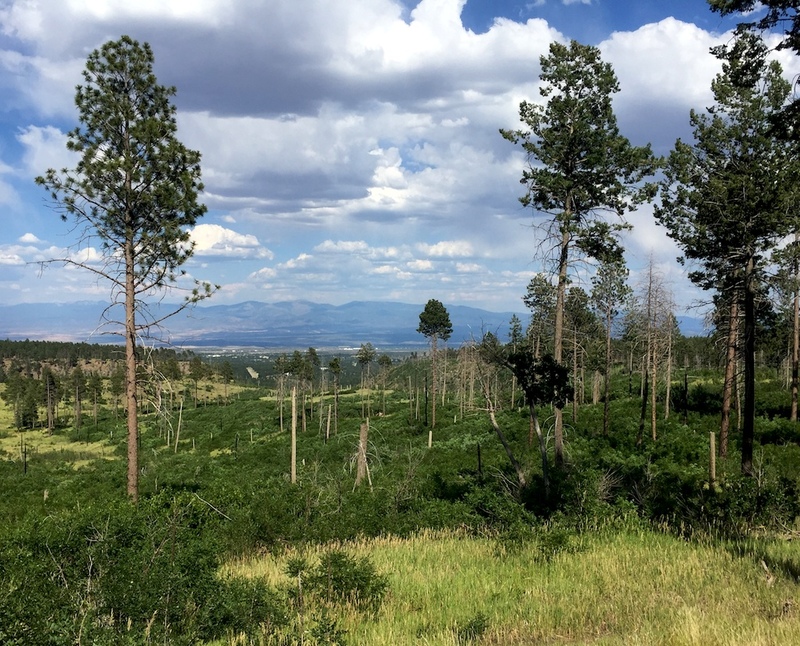 There’s a turnoff to the left that leads into the Santa Fe National Forest, with a dirt road going to American Springs. This is the turnoff you want. At the turnoff, there’s a display board with some info about the forest, and making sure your campfires are completely out. There’s a network of roads taking off from here. The main road leads toward American Spring, while others go to potential camping spots. There’s no water, no bathroom, and no garbage collection. In fact, this is just a boondocking site with no facilities besides a primitive stone fire ring left by earlier campers. But one thing it does have is fast T-Mobile LTE cell service! I didn’t want to drive down the road to American Spring, but I was happy to hike it! As you head down the road a little ways, it opens up to views over Los Alamos. This is really pretty at night, with the city lights twinkling in the distance. During the daytime, the hillsides show evidence of two recent forest fires (in 2000 and 2011). The remaining trees are considerably thinned out, which means the view is more open than before. The spring itself is very overgrown. It’s not a spring that invites you to come sit in it. Not at all. It’s a spring that you’d need a machete to fight your way into, so I decided to leave it alone, and continue hiking. There’s a trail down Water Canyon that takes off from the American Spring road. I followed it to the bottom, and it was a pleasant little canyon hike, with a backpacking campsite near the bottom that looks pretty sweet. You can retrace your steps, or walk back up the road for a 5 mile loop. A portion of Bandelier National Monument is directly across the road from this free campsite. There’s a trailhead there that will take you 12.5 miles down to the Visitor Center. It looks like a pretty interesting hike, and says it involves some scrambling, and a 2-mile section called “The Narrows” that is a flash flood danger zone. Maybe someday I’ll put together a car shuttle & backpack trip down there. Looks fun! It was very quiet here, with just some occasional traffic noise, which died down entirely at night. With good internet access too, this made an ideal spot to hole up for a few days and get some work done. 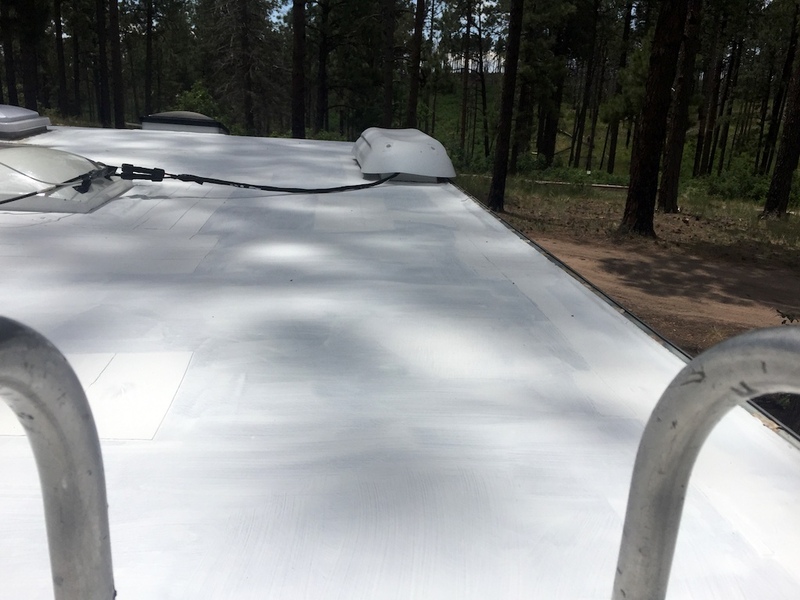 In addition to online work, this is were I started painting my camper roof with elastomeric roof paint. At 8,000+ ft elevation it was cool, I had a shady spot to work, and the forecast was for dry weather. All systems go for the painting project! All in all, this is not a place that I’d normally come as a destination, but it worked out well for me to escape the holiday crowds. It’s a good stop if it’s on your way, and it’s got internet service for a work location. I’d certainly stay here again if my route brought me this way. Boondocking campsite. Free camping near Los Alamos and Bandelier. Boondocking site with no facilities, but shady spots, uncrowded, and good cell service. Have you camped near Los Alamos or Bandelier, in either free or paid campsites? Do you have any favorites? Please let us know in the Reply section below, and Thanks for sharing!